Europe met Swiss eHealth at this year's IHE European Connectathon held May 21 to 25, 2012 with a record attendance of 520 participants and 250 visitors. Over 2,800 tests for interoperablity among 120 medical information systems were performed by 85 companies, including two new profiles that establish a foundation for patient-centric care by moving richer data sets through clinical workflows to physicians and caregivers. 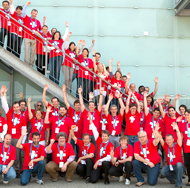 This was the first time the Gazelle platform used to coordinate the complex interactions of this five-day connectivity marathon was managed by IHE-Services, a dedicated operation within IHE-Europe that offers professional interoperability testing services for companies, national or regional health systems. Hosted by IHE Suisse, a clockwork organization enabled unprecedented connectivity during this marathon testing of health information systems. This year's event was fully operational at 9:57 am on the opening day when all systems successfully connected on the 50 megabyte per second network, two hours ahead of the previous 11 annual European Connectathon events, according to Tony Schaller, the technical director for the organizing group, establishing a new key performance indicator for the event.